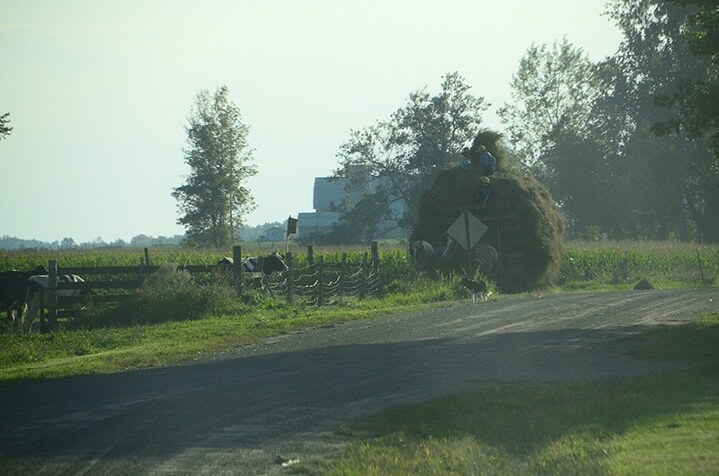 This work began on a late August afternoon driving the back roads near Heuvelton, NY. 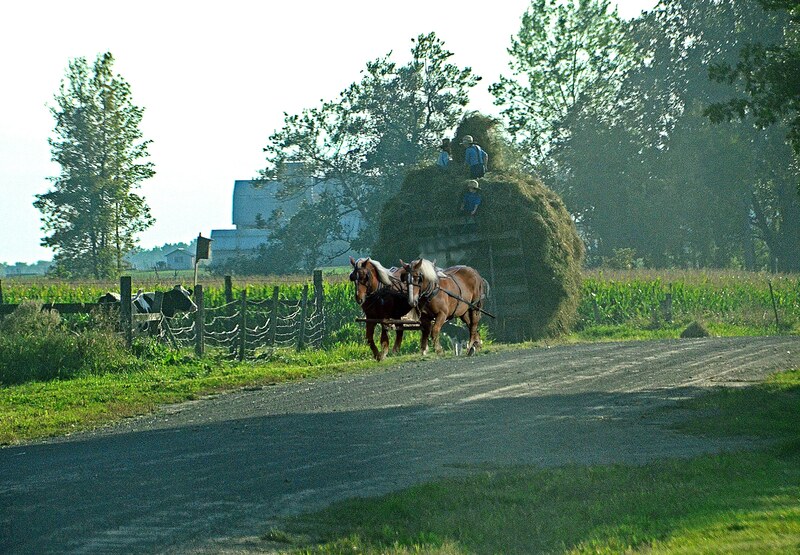 After passing this Amish hay wagon I took a photo just before the Horses turned into a field on the left. The horse were in shadow and blocked by a sign (see photos at the end of this page) so I substituted ones from another picture I had taken years before. I painted the background a yellow ochre. 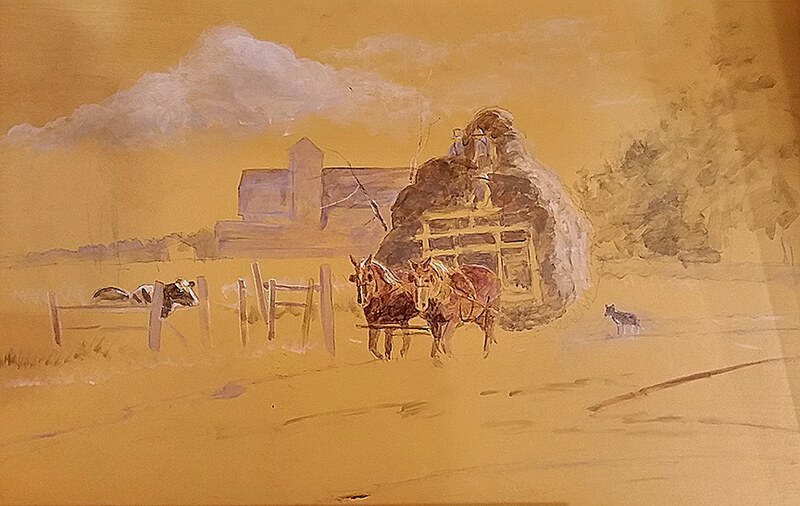 I sometimes do this in my paintings because it gives the painting a unifying tone, even though most of the color doesn’t show in the final stages, just enough shows through the thinner layers to give harmony to the painting. 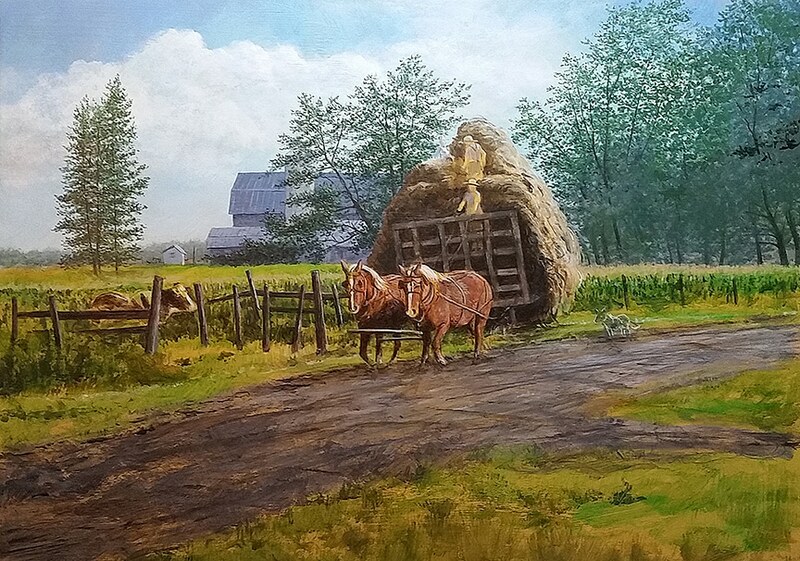 I started with the horses because they are the principle center of interest and I wanted to be sure they were placed right. Some of the image was sketched onto the board with a white charcoal pencil and some of it was drawn in with a thin layer of acrylic paint. Be sure to add acrylic medium to your paint when using thin layers to prevent the pigment from separating. 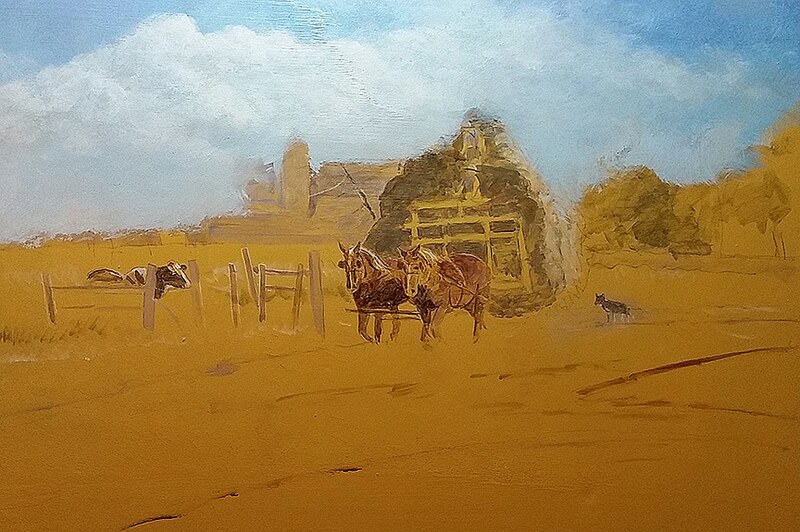 I then start to block in some of the values and other elements of the composition. The sky in reference picture was washed out. I used other reference to add clouds and cobalt blue, cerulean blue and white with just a touch of burnt umber to make the sky color. 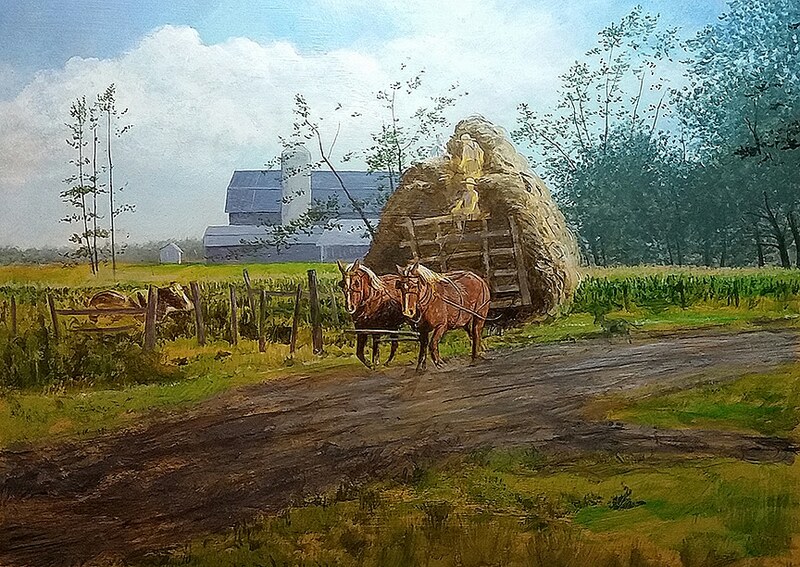 Working from background forwards, I the two blues previously mentioned with burnt umber to make the grays of the barns. For the greens I use Vermillion green mixed with cadmium yellow, yellow ochre and cerulean blue. 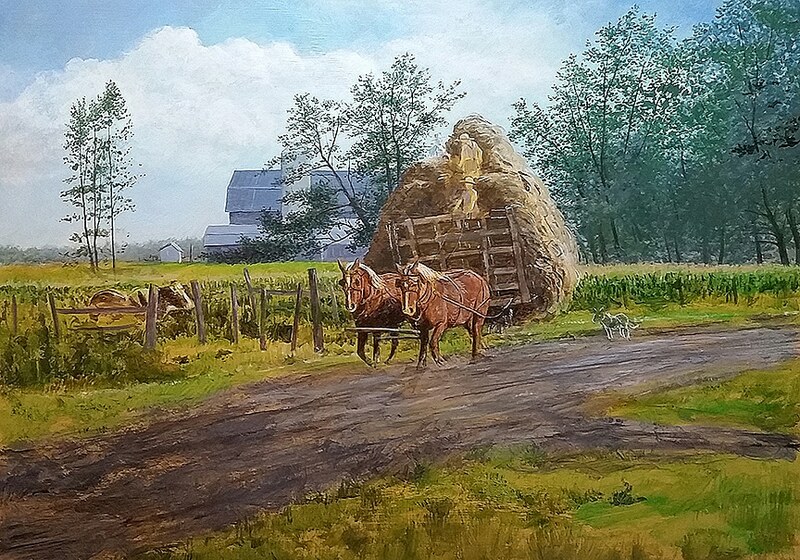 I now work various areas of the painting pushing the lighter and darker values. 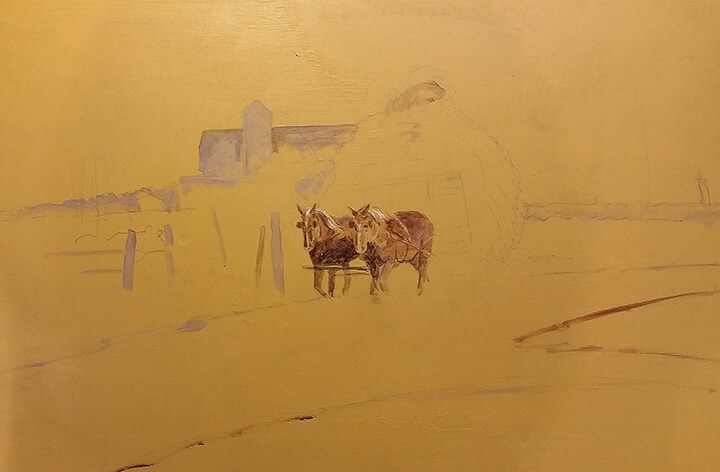 For the darker values I introduce ultramarine blue sometimes mixing it with burnt umber to get an almost black hue. 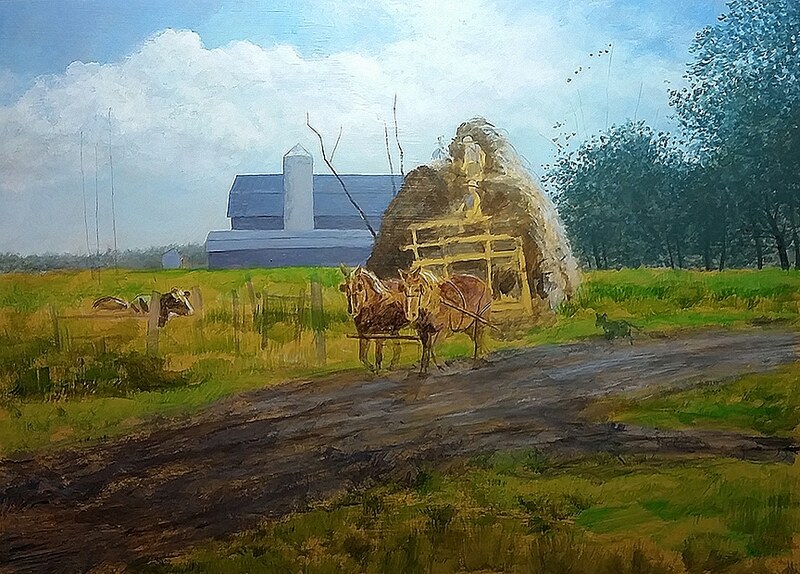 This step is mostly adding the background trees using a softer blue green for the distant foliage and yellow green for the closer ones. 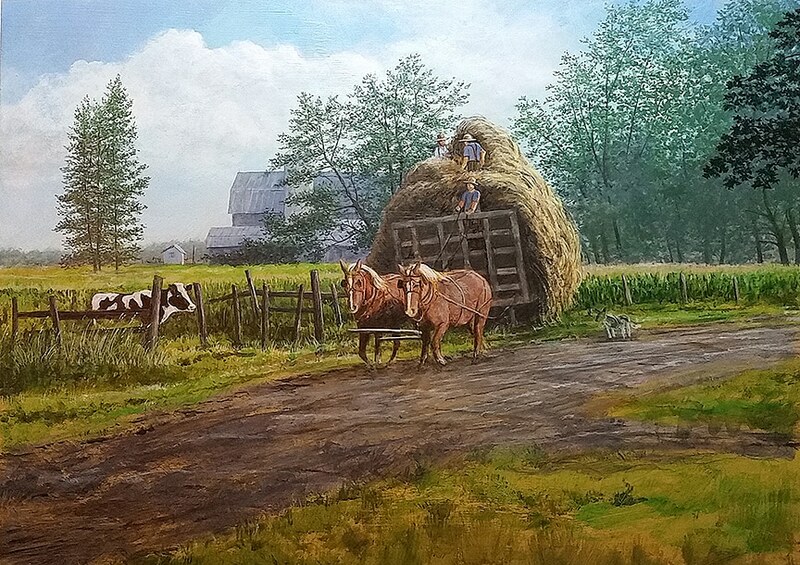 At this point things slow down as detail is added and adjustments are made to color and value. The tree on the top right is in shadow and provides good contrast to the muted background trees. I increased the volume of this tree to better balance the composition. This is the finished painting. 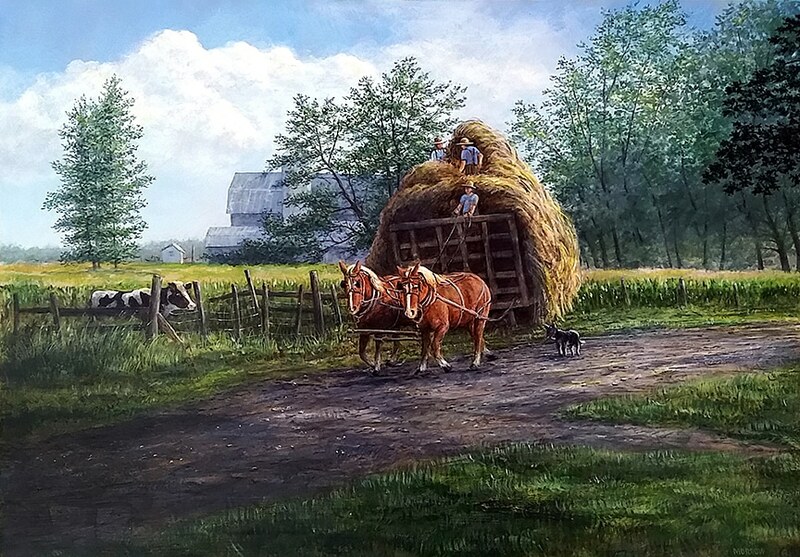 I brought a dark shadow into the foreground which visually pushes the wagon back adding depth to the piece. The final stages I will often do some glazing. This is done by mixing medium ( I use matt medium, but you can also use satin or gloss) with the acrylic paint. This creates a transparent wash that allows you to alter areas without covering up the under painting. Here are the photographs I used to create this piece. 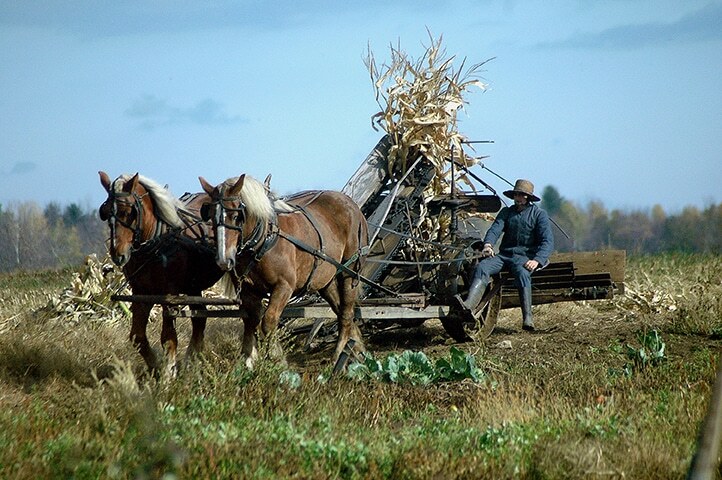 The original was shot quickly as the wagon was in the process of turning into a field. The contrast was poor and you can barely see the horses, so I used the ones in another image I shot years before. I then photoshoped the new horses into the original picture and made adjustments in contrast and color and cropped the it to the final composition. Hope you enjoyed this sequence of the development of this work.